In his book Franklin Barbecue: A Meat-Smoking Manifesto, Aaron Franklin says his favorite knife for slicing brisket is the Dexter 13463 S140-12SC 12-Inch Scalloped Roast Slicer Knife. I just got one, and it's bigger than any knife I've got. It's not a fancy knife. I'm looking forward to trying it on another brisket next week. Read the reviews and it seems to be a great knife to have. I never have smoked a full brisket, so that will be a no sale to Barb. I've got one based on the recommendation from the book and it works great. I just have no idea how to sharpen it. Still cuts well though. I just have no idea how to sharpen it. Still cuts well though. Ditto on my vintage Henkels 10" slicer. I have, so far, only used a steel on it and it's still plenty sharp. This is the one that Harry Soo recommends. Just got it and will be using it to slice bacon today or tomorrow. Last edited by Bob Ivey; 09-23-2016 at 07:31 AM. I've had several of the Dexter-Russel knives for years and that is a great knife for roasts or hams. I like the Duo-glide models for prepping/chopping cause my hands are not what they used to be. Both the Dexter and Victorinox/Forschner are of great quality. They are the ones used by the pros. I give a slight nod to Victorinox/Forschner because I like their Fibrox handles. That Dexter knife seems inexpensive for what it does. Originally Posted by Bob H.
The two brands mentioned above are the secret, sleeper deal on great knives. 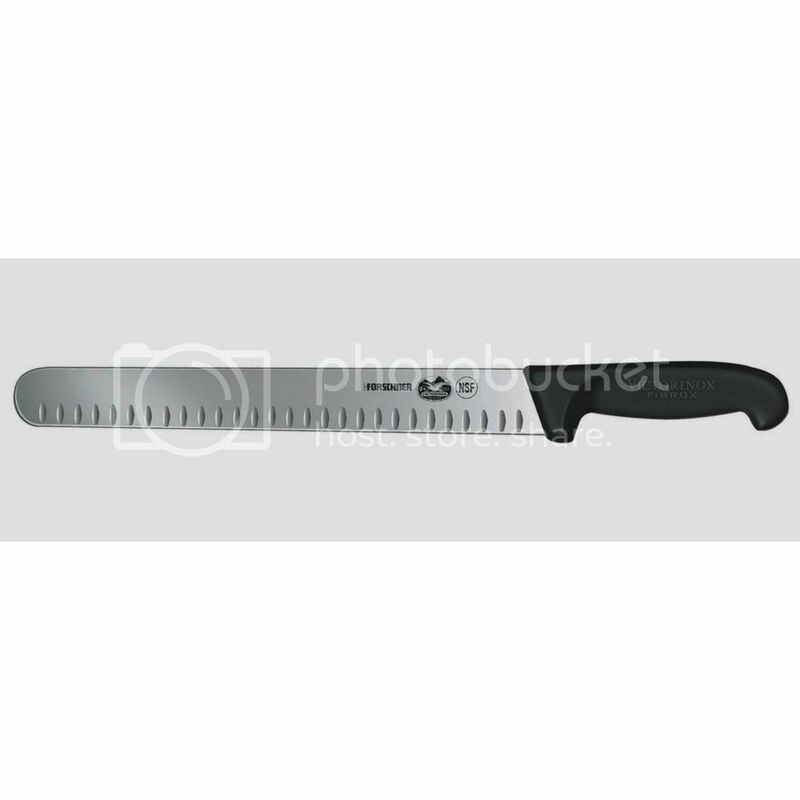 My two most used are the Victorinox/Forschner 8" chef's and the Dexter offset sandwich slicer. Great holiday gifts for those that don't have decent knives. Visit your restaurant supply store. Thanks for the post, Chis. I'm tempted to pick one of those knives up. I already have a Victorinox exactly like the one Bob Ivey posted, but there's always room for another type!